I love Newcastle, it has so many hidden depths and gems to discover, and despite living here for 13 years now I am still finding new places to go. 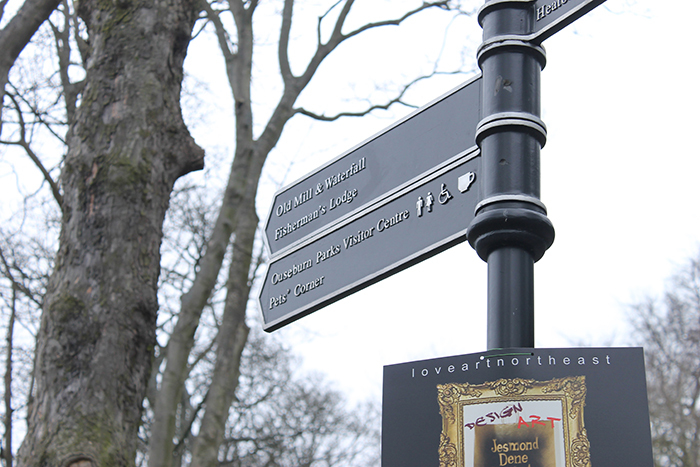 One of our favourite free places to visit with Zoe at the moment is Jesmond Dene. 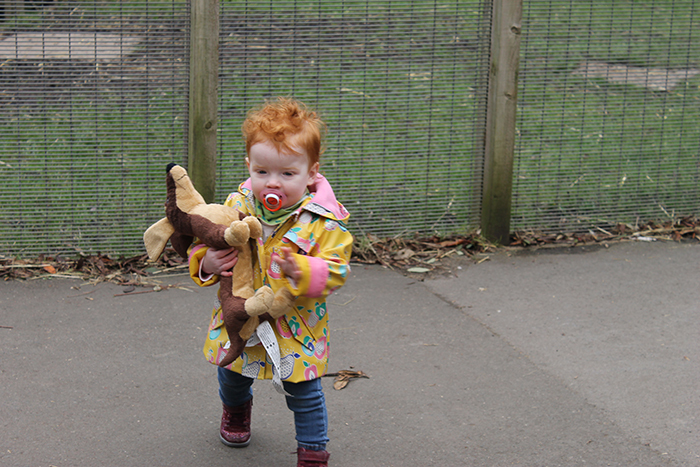 She can safely toddler about, and loves chatting to the chickens and ducks at Pets Corner. 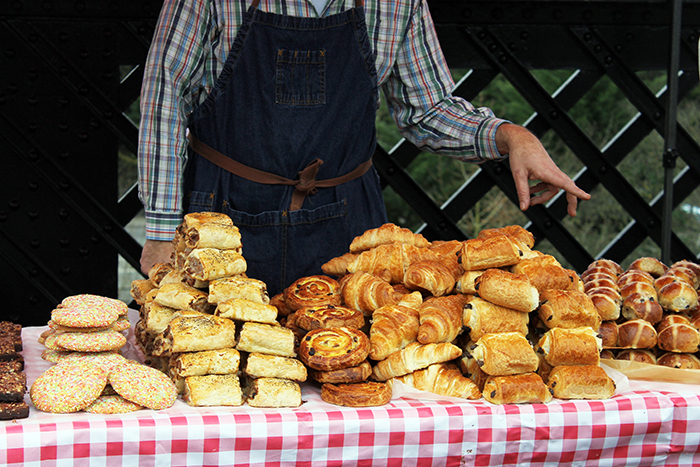 Every third Saturday of the month there is a food market on Armstrong Bridge, which overlooks the Dene. It is such a hidden gem, and so many wonderful local food sellers and producers bring their wares. 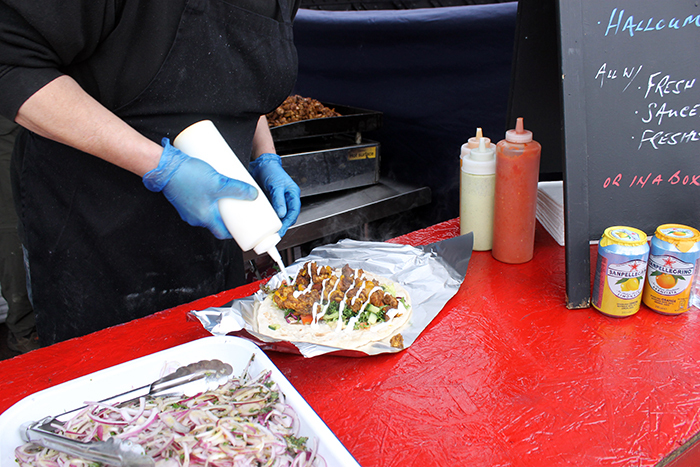 We decided to nip down on the Metro to the March market and we were not disappointed. 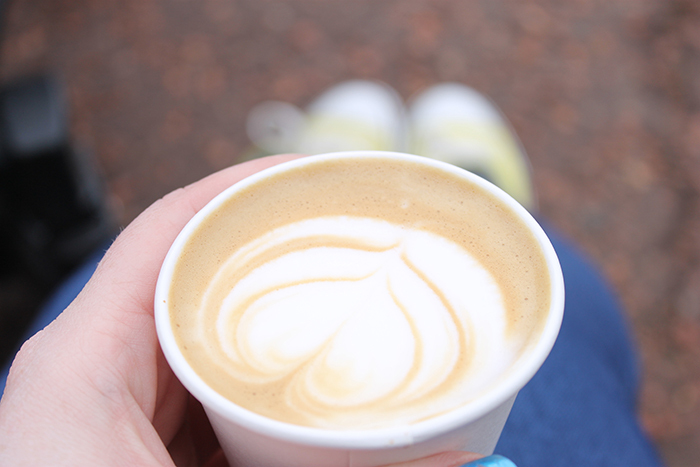 We got there for opening time (10am), so not everyone was fully set up yet, Zoe had fallen asleep on the way, so I took the chance to grab a flat white from OCC, and perch myself on a curb to watch the world go by. Paul had a few errands to run, so met us there, grabbing some Fat Hippo bacon sandwiches before heading for a wander through the Dene and the obligatory trip to Pets Corner. By the time we'd exhausted ourselves running around pointing at all of the animals, it was 11:30, and so we decided to grab an early lunch before heading home. Paul opted for a Brisket Roll from Longhorns, and I went for a HUGE chicken shawarma from Papa Ganoush. I took my proper camera for a change, so thought I'd share some of the pictures I took. I am slowly but surely getting a bit better at using my DSLR. I read this post recently which has really helped improve my photography. 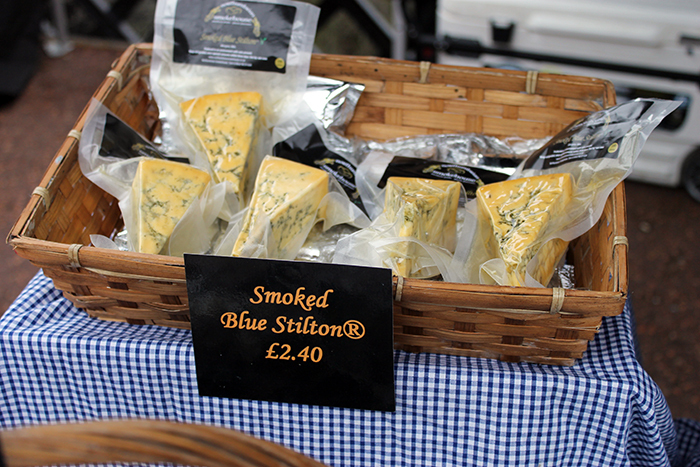 I couldn't resist grabbing some of this amazing Smoked Stilton from the Northumbrian Smokehouse stall. They had some samples, and this stilton while being fairly mild for a blue cheese, was packed full of smokey flavour and creaminess. Look out for it in a recipe soon. The next market is on the 16th April, follow them on Twitter for updates on the sellers that will be there (it changes each month). Family Farm at Whitehouse Farm. Zoe is totally animal crazy at the moment, her favourite book is this little board book which has a different animal on each page. We read it roughly 100,000 times a day, doing the sounds for each. Although according to Zoe all animals say "quack quack". Oh and also, what sound does a giraffe make? So with this new obsession in mind we decided to take a trip to Whitehouse Farm near Morpeth. Last weekend was Northumberland Residents Festival, where Northumberland County Council team up with lots of local attractions to offer discounts for residents of Northumberland. Now, technically I no longer live in the notorious NE61, but thankfully my Sister still does. Whitehouse Farm were offering 2 for 1 on entry, so for two adults and an under 2 it was only £9.50. A total bargain considering all of the attractions they have on offer. On top of the animal petting and feeding type activities you expect to find on a farm, they had a free bouncy castle, trampolines and go carts, a soft play, ride on tractors, an adventure playground and plenty of outdoor space for little legs to run around in. Zoe was absolutely in her element, she loved the petting barn, pointing at all of the different animals and saying 'quack quack'. She loved feeding the goats and watching the baby chicks, she even for to pet a giant rabbit called Larry. The feeding shed was crazy busy, with kids queueing and crying at only being able to bottle feed the lambs for 10 seconds. It was pretty brutal, so we decided not to stick around for that activity, instead checking out the birds of prey and owls. The weather was great, it was warm enough to not need a coat although there was a lot of mud around, which made me wish we had put Zoe in wellys and waterproofs as she fell a few times, leaving her with muddy knees. We expected it to me much busier than it was, but thankfully we caught it at the right time, leaving around 1pm as most people seemed to be arriving. We'll definitely try to go back, maybe over Easter when they have some sort of Easter Eggstravaganza going on! I would really recommend a visit to Whitehouse Farm, there is lots to do for children of all ages. 1. Zoe got her level 4 starfish award this week. We have been going to swimming lessons since she was 11 weeks old, and I am so glad we stuck it out. Yes, it is expensive, but as I was such a terrible swimmer and general scaredy cat around water as a child I am desperate for Zoe to be water confident. It is lovely to see her so happy in the water, she kicks and splashes and propels herself around the pool (using a noodle), she also jumps in from the side independently and turns and reaches for the side. It makes me so proud and I hope she carries on loving water. If you are local to me (North-East) I can highly recommend Squidgers Swim School in Whitley Bay. 2. Anyone else get out in the sun on Good Friday?! We nipped to the local shops, without coats! It was so lovely to be able to carry Zoe in the sling without piling on the layers, and the world just seems like such a happier place when the sun is shining. I think I am still a little high from all the vitamin D! 3. I love this picture of us, even if it is just a shameless lift selfie taken in Primark. I love that I can still carry Zoe, even though she is getting bigger (and heavier). This is a Didymos Houndstooth Ringsling, which I had made by Rock Solid Slings. 4. After my moan last week about the cost of kids shoes, I found these little cuties in TKMaxx. Not bad for only £9.99. I am hanging on for a Clarks or Startrite sale before I get her a 'proper' pair. Although these are perfect and fit really well. 5. In the immortal words of Lorelai Gilmore; Coffee, coffee, coffee... I love my coffee. I have a great Delonghi machine at home, which makes delicious espresso and has a steam spout for making my favourite flat white. I recently moved into a new office at work, and someone bought a Nespresso innisia machine, I really want to like it, you know because George Clooney does, but I just can't get on board with just americano or adding a bit of milk. If anyone has any tips for making flat whites without having to buy an £80 Aeroccino, that'd be great. 6. Last Saturday we went along to a fantastic free bubble show in Leazes Park. Jesse the Bubblologist (how cool is that job title!?) blew my mind with her giant bubbles. Zoe laughed and chased bubbles for an hour, it was so much fun I am seriously considering a bubble party for her 2nd birthday. Hope everyone else had a lovely week, and are enjoying the long Easter weekend. We are up in Northumberland with family this weekend, enjoying the rain. 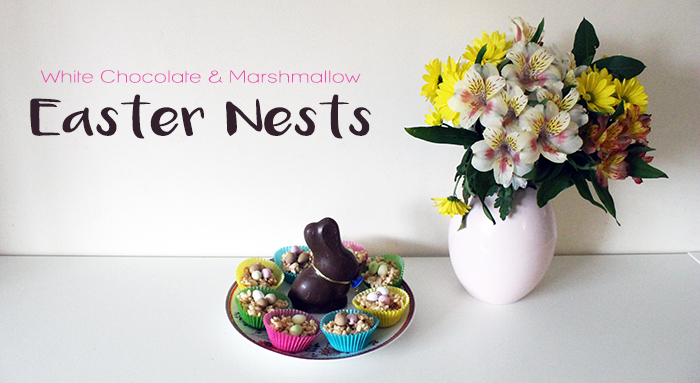 White Chocolate & Marshmallow Easter Nests - Baking with a Toddler. I have this idyllic idea of baking with my daughter, all mini aprons and tiny wooden spoons, like something from a Cath Kidston advert. I can tell you that at 15 months, this is simply not the reality, not even a little bit. Sadly I feel like Zoe is a little too young to understand the concept of baking. 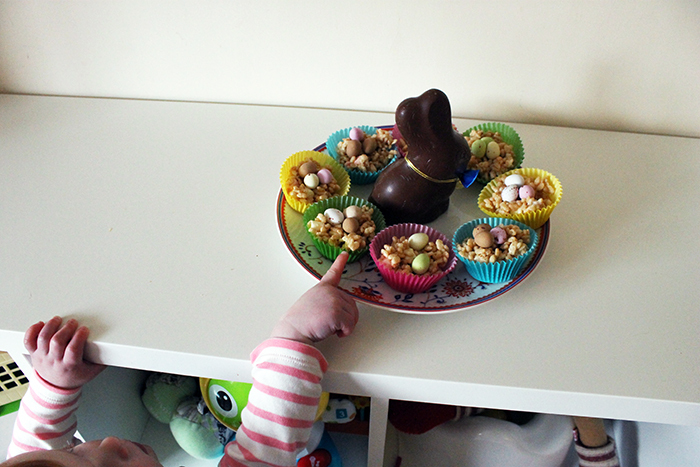 I set up all the ingredients, with mini baking equipment for Zoe, and showed her how to stir, and spoon into the cake cases... She was not the slightest bit interested, instead she acted like we were having some sort of post-lunch snack of chocolate coated rice crispies and mini eggs. She then cried when I took them away. All in all a bit of a fail. I think I will wait a few more months before we try again. This is a great recipe for making with kids though, there is no actual baking involved and its safe for them to do themselves. You can pretty much add anything you like to them, from more virtuous dried fruit and nuts, to other easter sweeties and chocolate. 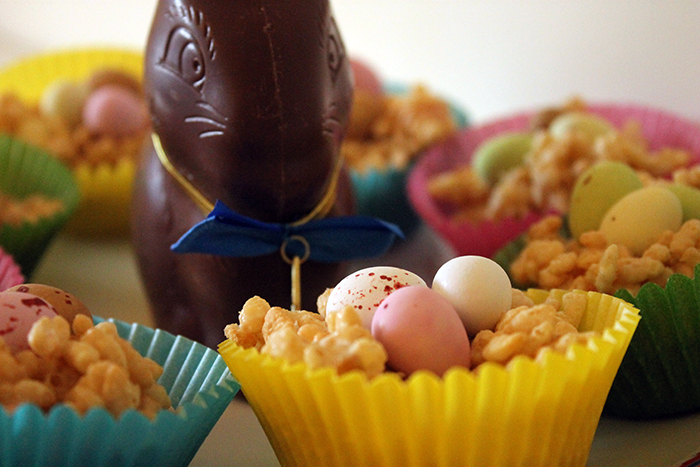 We opted for mini marshmallows and mini eggs. Simply melt the white chocolate, I use the microwave in 20 second increments, stirring in-between, until fully melted. I didn't weigh my rice crispies, just adding a bit at a time until the mixture was well coated but not too 'wet'. Then mix in the marshmallows and spoon into muffin cases. Top each cake with 3 mini eggs. They set in 20 minutes at room temperature, or you can pop in the fridge if your littles are a bit impatient. 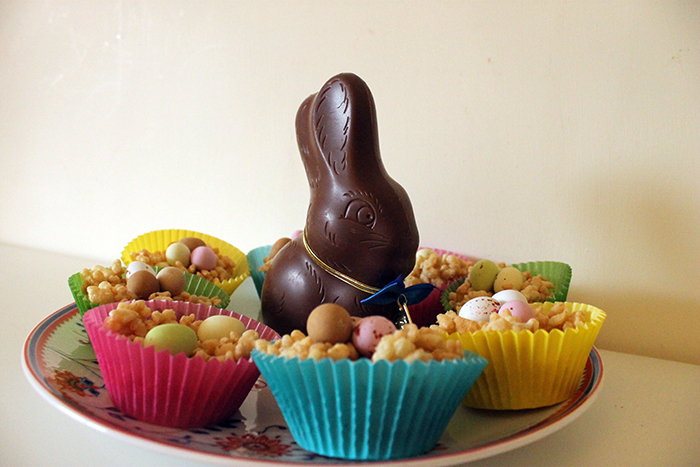 for some other fantastic Easter related bakes, check out my Mini Egg Brownies, my Hedgehog Traybake and Traditional Hot Cross Buns. 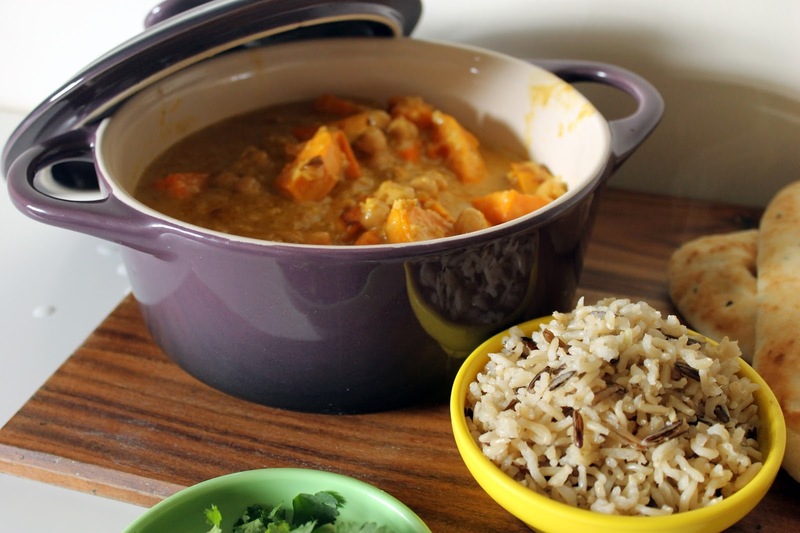 Vegan Sweet Potato and Chickpea Curry. I recently did a spot of recipe development working with Wayfair for a great alternative Vegan Easter Menu. I has been a while since I sat down and planned a new recipe and dusted off the DSLR to take proper photos. It felt really good and I was so happy with how they turned out. I am not usually a Vegan recipe type of girl, living with a very carnivorous man can mean that if a meal doesn't contain meat, its simply not a proper meal. However, even he admitted that he didn't really miss the meat in this dish. Although, if you fancy you can easily add a bit of chicken, I think it would be great with leftover roast chicken added right at the end. 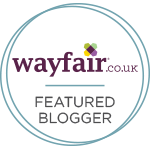 To check out the recipe in full, head over to Wayfair, there are some wonderful recipes from Sophie at The Cake Hunter and Aimee from Wallflower Kitchen too. I am absolutely in love with this purple casserole dish from Wayfair by the way, its the perfect size for a family of 3 and is so pretty. Hello, my name is Nelly and I am a spa-virgin. Before last week I had never set foot in a spa, I didn't get it. I've never been a super girly girl, or felt the urge to be rubbed by strangers. Also, the fear of new situations that involve swimwear is real. Well thanks for the wonderful team at Mineral Spa, within the Crowne Plaza Hotel in Newcastle I am no longer a spa virgin, in fact I am a total convert. Holy relaxation batman! You know that feeling when you didn't realise how tense you were until you actually relax. My shoulder must have been up by my ears when I walked in, but by the time I left I was a puddle of content jelly sliding onto the metro. The Crowne Plaza is quite a new addition to the up and coming Stephenson Quarter of Newcastle (for locals, its the bit behind the train station, also the area where the Boiler Shop events are held), at first glance you could mistake it for an office building, but then you spot the spot the sign for the Gin Bar, and know you're in for a treat. 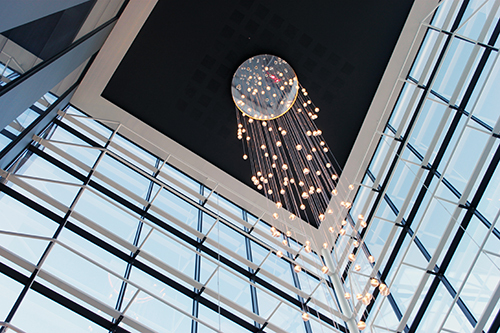 The entrance way is gorgeous, with a huge hanging chandelier hanging the full height of the building. 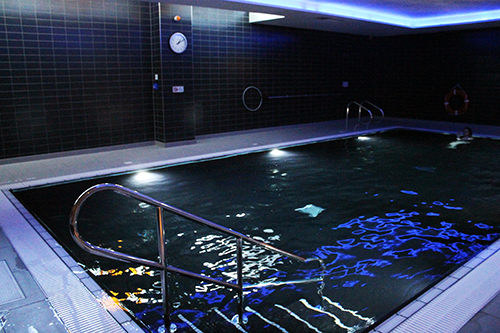 A quick trip in the lift to the lower ground floor and you enter the calming Mineral Spa. Unlike the light and airy foyer of the hotel, it is dark and instantly relaxing. 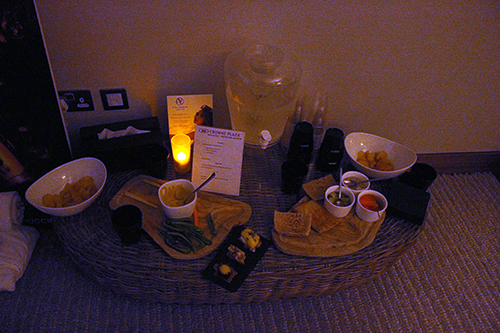 I was shown to the relaxation corner, and offered some yummy canapes and mocktails, the mushroom pate was an absolute delight, and the pineapple and raspberry mocktail refreshing. I got to hang out with some other really cool local bloggers (Nyomi, Laura, Rachel and Chloe), we chatted about blogs, my spa virginity and randomly gun control. I really enjoyed a good natter, but I was keen to check out the facilities. The lovely Spa manager pointed me in the direction of the changing rooms and answered my silly questions like a complete professional. She did ask me if I wanted to use their gym facilities, which made me chuckle, I am so not a gym bunny. Complete honesty here, the robe was cosy, if a little on the small side, this photo cunningly disguises the unflattering gaping just below crotch level; attractive. Once I was in the spa itself though, I took it off. 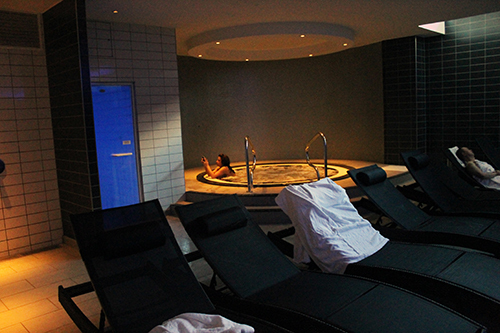 My favourite part of the whole spa was definitely the jacuzzi, I want one of these in my house! I could have easily spent the full two hours getting lost in the bubbles. The steam room was really hot (duh!) but surprisingly relaxing, I could feel my pores opening and while I could only manage a few minutes at a time, I did keep going back for more. The pool was small but perfect for the space and number of people there. It was cooler than the jacuzzi, but so refreshing. I actually forgot how much I enjoy swimming, my arms were pleasantly aching after a few lengths and I felt I deserved more jacuzzi time. Once my fingers were sufficiently prune-y, I took advantage of their free wifi and lay on the loungers, instagramming smug spa photos. The two hours flew by, and honestly I could have happily stayed all day! Once my 2 hours was up, I got partially dressed out of my wet swimmers, and back into my clothes (I kept the slippers on) to head to the lobby for my Orly Manicure. 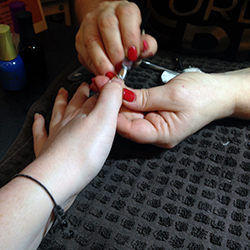 Now, along with being a spa virgin, I also have never had my nails done professionally. 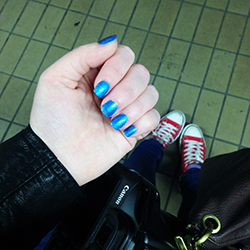 The manicurist was so lovely, I am always a little awkward in these situations, I am not great with the small talk, and sitting so close to someone, I honestly thought it'd be awkward-city. She was the perfect level of friendly, without being super chatty. There was some comfortable silences, peppered with chats about our children, information about the products, and just general chit chat. Although credit to her, I mentioned my idiocy on my way out and she sat me back down and redid it! 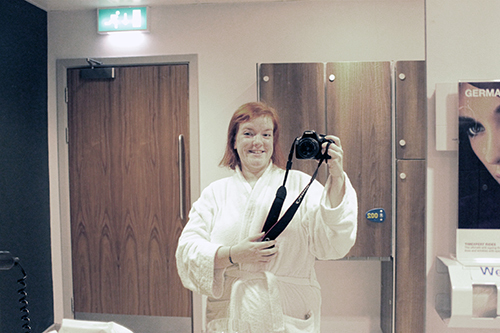 Honestly, I fell really terrible as I didn't ask her name, but she was an absolute diamond and a credit to the spa. The Orly products are a bit magic and I am super impressed with how well they last. I got a bottle of polish and top coat in my goody bag which I cannot wait to try, my summer toes are going to be perfection! All in all it was the most perfect afternoon for this stressed working Mama, I needed it and will definitely be back. Their Mineral Moment Package (which is what I had) is only £55. A perfect gift (hint hint) for that special someone in your life. I really wished we'd had more time to enjoy a lovely cocktail in the Gin Bar before heading home, but after 3.5 hours in the spa the Mum-guilt was setting in and I had to get home for tea-bath-bed time with Zoe. Last week's Sausage Risotto was amazing! I feel like I am well and truly back into the swing of things, I stuck mostly to my plan last week and it felt good. I had some great meal wins with the sausage risotto and prawn pesto pasta. I am definitely feeling inspired to try new things and get out of the food rut we are stuck in. I also moved into my new office last Tuesday, which has its own mini kitchen, so I feel more inclined to take food into work and cook things, rather than just grabbing a sandwich on the go. I have also been having a long hard think about going back to Weight Watchers again, anyone doing the WW Plan? Would you recommend? Monday - Leftover Roast Risotto, we had a roast dinner on Sunday, so I saved some chicken and carrots for tonights risotto. After last weeks triumph, I have high hopes. Tuesday - Prawn and pesto pasta, it was so quick easy and delicious last week, we decided to make it again. 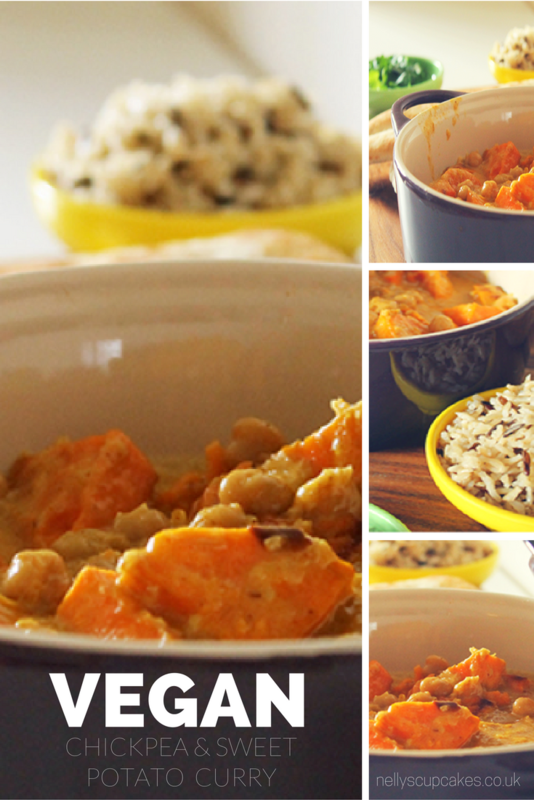 It is the perfect quick recipe for our busiest night of the week. Thursday - Toastie night! We do love a good toastie in this house. Friday - Lasagne with garlic bread and salad, we have family visiting and they arrive on Good Friday, so a tray of lasagne will be waiting. 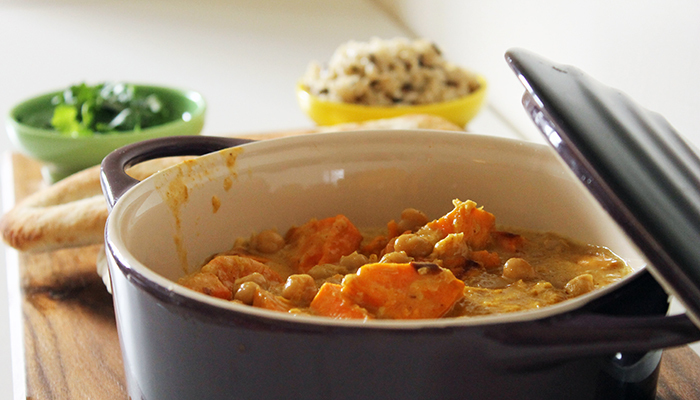 Check out the #mealplanningmonday hashtag on social media to see what everyone else is eating! 1. I feel like a terrible food blogger admitting this, but I have been reluctant to bake with Zoe. Honestly I just think she is too young to understand what we are doing, and in reality she just sat and ate the ingredients like we were having a post-lunch snack of chocolate covered rice crispies and mini eggs, no biggie. 2. We got a new washing machine! It is so white and shiny, and has lots of buttons and settings which I haven't even begun to explore fully. It has been on non-stop for the past 3 days catching up on the backlog of washing that had built up, our house was starting to look like New York when the garbage men were on strike... except with laundry obviously. 3. I finally feel like I am back to blogging this week, I have been working on a bit of recipe development with a brand this week, and got my fancy pants camera and new tripod out. I was worried I may have lost of mojo a little but honestly I am so pleased with these pictures, and cannot wait to share them with you all. 4. Here's a sneaky behind the scenes picture for you, when you do finally see the fancy pictures I was talking about above, remember that just beneath the lens was this whole heap of mess! Behind every perfect looking instagram shot, is a hidden pile of crap, remember that. 5. SMUG SPA PHOTO! 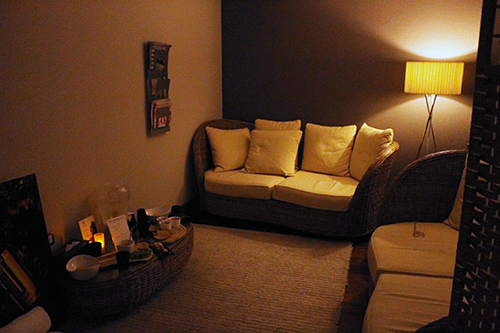 I went to a spa last Thursday! Mineral Spa Newcastle to be exact. I had some training to do for work in the morning so Paul took the day off to watch Zoe, so when the invite to a blogger event came through for the afternoon it seemed like fate. I have never felt so relaxed in all my life. Review coming up on Wednesday. 6. STOP GROWING! Seriously, why do children's feet grow so fast? I love these glitter boots so much and I am really sad that they are getting snug. Also, why are children's shoes so expensive!? I am heading to the Clarks outlet at Royal Quays on Wednesday to hopefully bag a bargain *fingers crossed*. We are not really stay at home types here, we are very much out and about, meeting for coffee, soft play, lunch, play date sort of people. I find it quite difficult to spend a full day in the house and inevitably we end up a little bored and restless and shouty. I do wish I was more of a homebody, keeping a perfect home while simultaneously planning educational toddler activities, but alas, thats just not me. 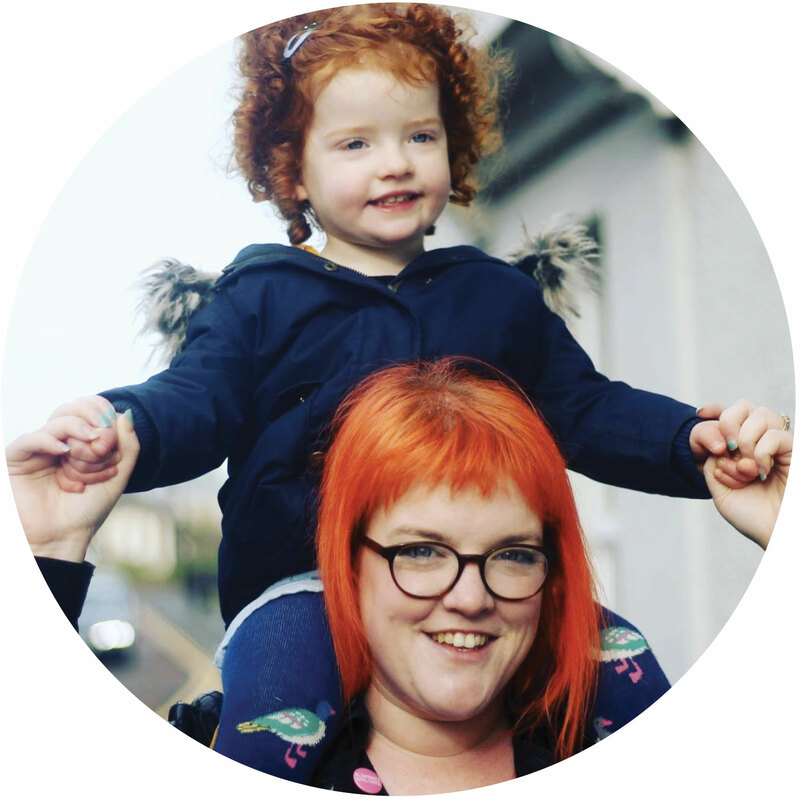 I do follow a lot of pages and blogs that share hundreds of great messy play, crafty and super fun play ideas for pre-schoolers, which in theory look awesome, but in reality never turn out right or I spend ages planning and she doesn't show the slightest bit of interest. Anyway, last week I had a day off work, which coincided with waiting in for a plumber to come and 'fix' our washing machine (it was unfixable, sigh) so we were housebound, and I was determined not to spend it restless and shouty. So I took to my facebook page (have you liked my facebook page yet? *wink*) to ask for ideas for activities to keep us sane. I got lots of great ideas, but decided to try and create some homemade play dough, known as cloud dough. It looked really fun and a bit messy (instant toddler hit) but also not really difficult or time consuming (Instant mummy hit). Needless to say it was a huge hit with Zoe, she loved squishing and making imprints with her hands, I also dug out some cookie cutters, a mini rolling pin and various bowls and containers I had laying around. We squished and rolled and made shapes for nearly an hour, which is pretty impressive for a 15 month olds attention span. After about 50 minutes she started smooshing it into carpet and trying to eat it, so I called it a day, but I popped it into a zip lock bag so hopefully it'll last a little while. I didn't follow any specific measurements, just added a bit of flour and conditioner into a mixing bowl, and kept adding and mixing until it reached the perfect consistency (I used a spoon until it was kneadable). I divided into 3 equal balls and added food colouring, depending on the depth of colour and amount of food colouring, you might need a bit more flour, to counteract the moisture... Just keep playing until it perfect. The bonus of this 'cloud dough' is as well as being mouldable and soft, it doesn't taste great so after one go at eating it she didn't try again. Zoe ended up mixing all three colours together, which I know totally bugs some people, but it looked SO COOL! It was pastel-y and swirly and reminded me a little of a lush bath bomb. 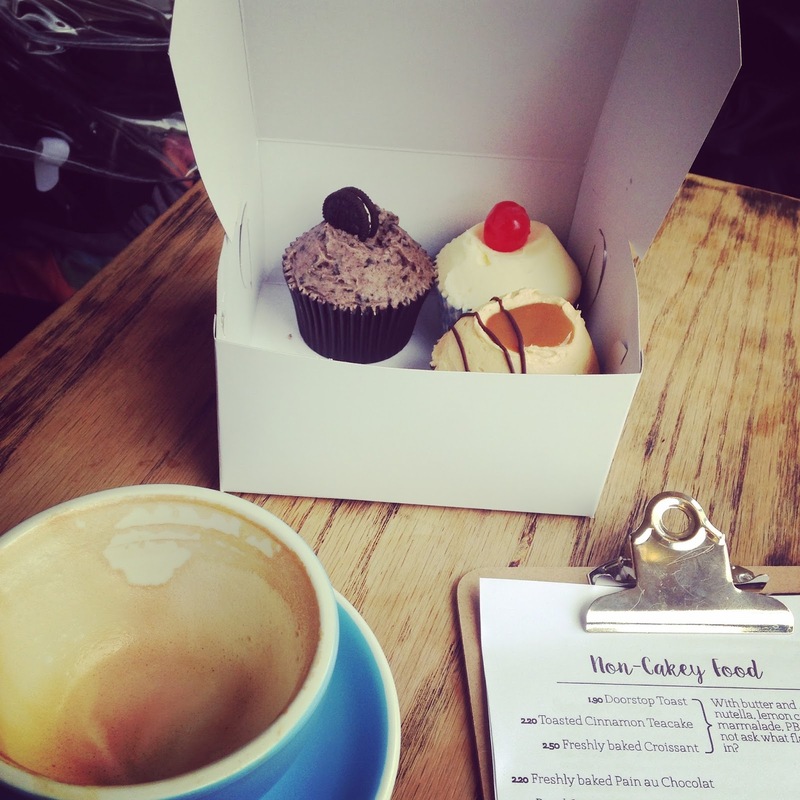 My top 5 Coffee Spots in Newcastle. Anyone who follows me on instagram, or indeed knows me in person, will know of my love of good coffee. My idea of pure heaven is a decent flat white in a bustling coffee shop, just watching the world go by. 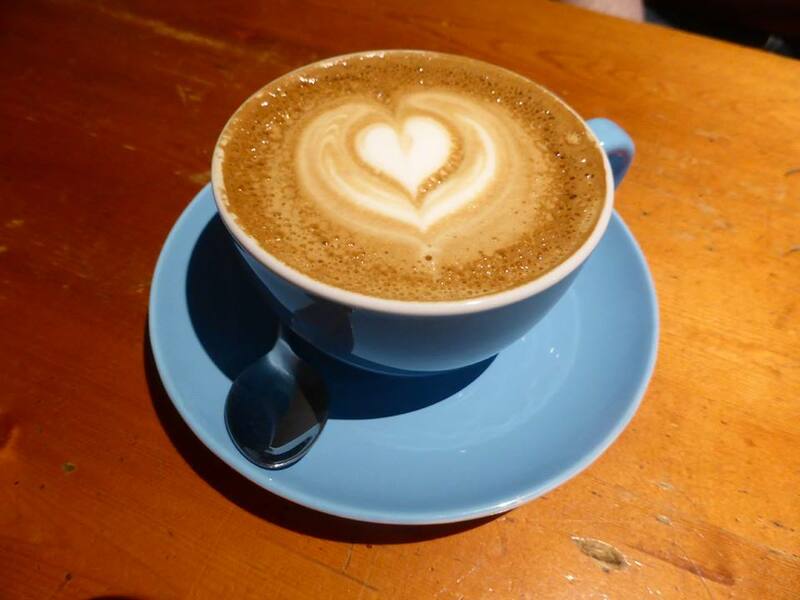 I am a big fan of lattes and flat whites, I like strong but smooth coffee with a creamy milky finish. I probably spend far too much money enabling my coffee habit, but my reasoning is that I don't go out on the town or spend money on extravagant clothes or shoes, so I deserve a little treat now and again *cough* daily *cough*. 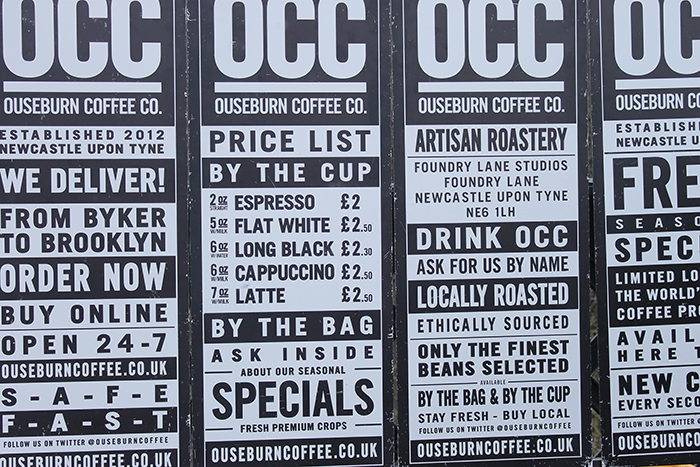 So with this in mind I thought I would share my favourite coffee spots in Newcastle upon Tyne. There are so many to chose from, but these are top of my go-to list. 1. Flat Cap Joes - In my opinion this is the best Latte in Newcastle. Joe is an award winning barista and is so crazy knowledgeable about coffee, a visit to his cafe is a definite education in brewing methods. Sadly FCJ is slightly limited in opening times due to location (tucked away in the basement of a shop on Ridley Place) so doesn't open before 10am, so I can't get my workday morning jolt from him. Being downstairs also means I can't nip in if I have the buggy. I live in hope that he might move locations one day, but until then I settle for sporadic child-free visits when possible. 3. Tyneside Bar Cafe - This is our (mine and Zoe's) favourite lunch place, they do an amazing grilled cheese sandwiches on sourdough bread with a hint of spring onion, and have highchairs and crayons (sometimes they even show cartoons on the big screen). While it is great and child friendly, it also has a grown-up vibe and absolutely cracking coffee! 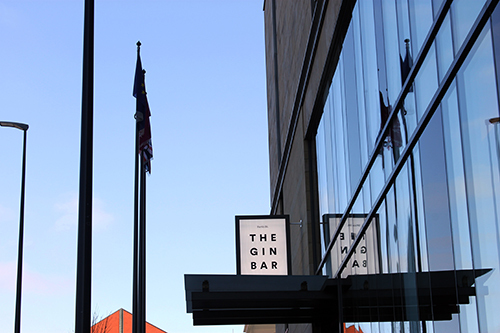 I dream of going in one day after dark and sampling their drinks list, and maybe nipping next door to the Tyneside Cinema to see some fabulously arty film. 4. Cake Stories - Jesmond This place is a little gem, not particularly central, but worth a couple of metro stops. They have a vast selection of cakes and sweet treats to chose from and some delicious coffee! We often like to nab the comfy sofa in the window and spend an hour indulging in cake. This is the kind of cafe that makes me wish I was self employed and could spend my working day here. They have outlets by each table for laptops and phones and free wifi. They are child friendly and have Ikea highchairs. 5. Ugot - Central Station This is a bit of a new and quite random find for me, we were off to visit the inlaws by train on Mother's Day and I NEEDED a coffee in a hurry. There are a few coffee places in and around the station but I only had 10 minutes and the queue at Costa was out the door, so I ran into Ugot (which was empty) and grabbed two coffees and two gluten free Orange and Coconut muffins. Game Changer! The coffee was so smooth and almost nutty in flavour, strong but not bitter. The muffins were light and packed with flavour and freshness! I will definitely be going back, and it is now my go-to place before jumping on a train. This is my top 5 of the places I have tired, however, I am always on the hunt for a great cup of coffee, so please let me know if there is somewhere I need to try! Baby CPR with St Johns Ambulance. A letter to my Mum. 5 ways I cope with Hurricane Toddler.